The first legally approved HIV self-test kit that allows people to get a result in 15 minutes at home has gone on sale in England, Scotland and Wales. This new "do-it-yourself" test is made by company Bio Sure UK and can be bought online. It works in a similar way to a pregnancy test, measuring levels of antibodies - proteins made in response to the virus - in a person's blood. The company recommends attending sexual health clinics for advice and further blood tests if both lines appear. And even if the test is negative experts say it does not mean people are definitely virus free - especially if exposure occurred within the last three months. Charities have welcomed the test and hope it will encourage more people to get checks - particularly those reluctant to go to clinics in the first instance. Dr Rosemary Gillespie, chief executive at Terrence Higgins Trust, said: "We campaigned for a long time to secure the legalisation of HIV self-test kits which happened in April 2014, so it is great to see the first self-test kits being approved. Shaun Griffin, also at the charity, said: "At the moment there are funding challenges throughout the NHS, including for sexual health services. 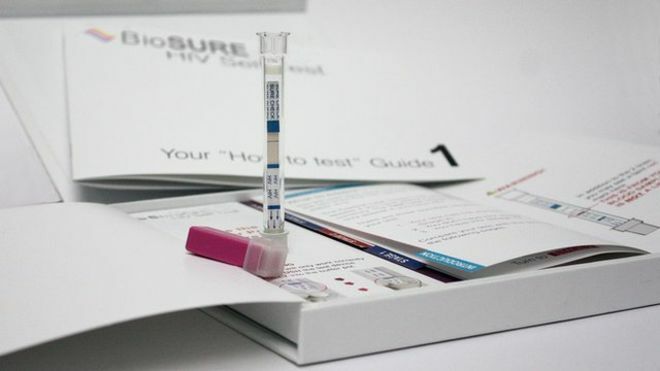 "It is absolutely critical that people have access to HIV tests and advice they need." Free HIV tests are available across the NHS. In Northern Ireland ministers are considering legal changes to allow the sale of home testing kits.